King George IV loved beautiful things. It is said that Buckingham Palace and the Windsor Apartments still reflect his exquisite taste in art, furniture, and interior design. His passion for masterpieces of art also translated to a vast collection of beautiful jewelry, both acquired and custom made for him. One of the most prominent pieces of this collection, the State Diadem, was designed to his specifications. Historians report that he commissioned Royal Jewelers, Rundell, Bridge and Rundell, to construct the crown in 1821, for his coronation. Though he petitioned to have the Imperial State Crown permanently replaced with the State Diadem for the coronation ceremony, his request was denied by Parliament. He did, however, birth the tradition of wearing the State Diadem during one portion of the ceremony. The custom at the time of George IV’s coronation was to lease the jewels used in the crowns from a local jeweler. The jewels, inset before the ceremony, were removed following the ceremony and returned to the Royal Jeweler. This remained the custom for the diadem until Queen Victoria’s coronation, at which time the gems were soldered into the frame permanently. The diadem was her crown of choice for multiple family and official events, and it has remained a favorite among the queens ever since her reign. In her will, Victoria gifted the State Diadem to the Crown. 1. Queen of Crowns Blog. "George IV State Diadem Crown." Posted September 9, 2007. Accessed May 22, 2012. http://blog.hollyhardwick.com/2007/09/george-iv-state-diadem-crown.html. 2. "George IV State Diadem Royalty Tiaras." The Wedding Tiara. 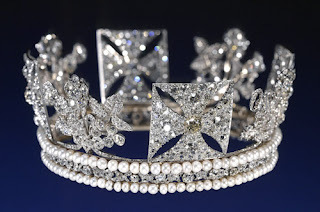 Accessed May 22, 2012. http://theweddingtiara.com/archives/george-iv-state-diadem. 3. "King George IV State Diadem." Royal Exhibitions. Accessed May 22, 2012. http://royalexhibitions.co.uk/crown-jewels-2/royal-regalia/. 4. Butschal, U. "Queens Juwel Casket--Windsor." Royal Magazin. Accessed May 22, 2012. http://www.royal-magazin.de/queenbrooch.htm. So beautiful! What made you want to blog about jewelry by the way? Echo, I have been attempting to blog about jewelry for the past two years. It started when one of my brothers asked me to think about getting into it as a career writing move. It has taken me two years to research it enough to believe that I have something worth saying about it all! So, here I am. It is a joint venture with a special anonymous sponsor, so in fact it has become a lucrative career move on my part. My dream for this site is that it will become the resource I've been looking for in researching this amazing aspect of art history!